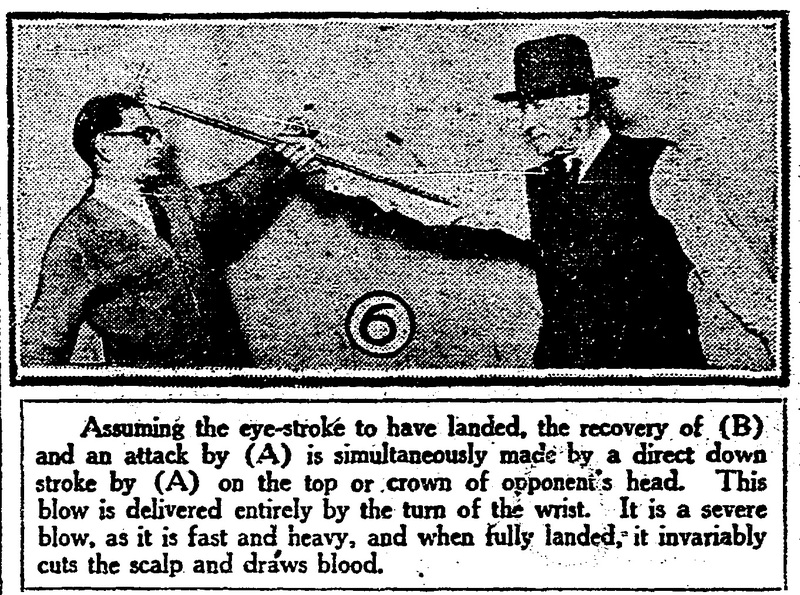 A unique method of cane defense as described by James I. Pearson in 1924. As I indicated in my latest article on Irish stick fighting, outide of the traditionnal styles there exists perhaps only two documentary sources which would allow us to reconstruct a workable style of bataireacht. Both of them present characteristics which are presented in other sources as well as in the traditions. But there are also styles of stick fighting from other countries which present similar elements. This new source which I am presenting today is perhaps one of them. 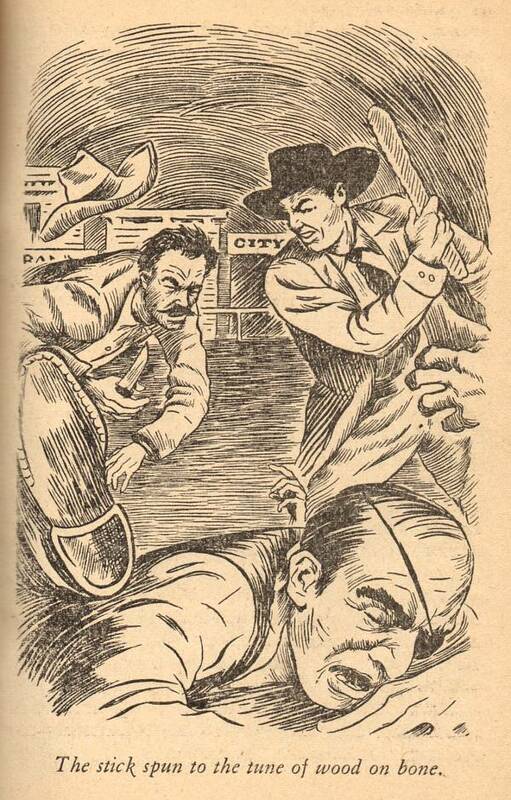 The Pearson style of walking stick as a weapon, or “stick control” first became known to us through a 1924 short story called “Nightmare town” by Dashiel Hammet. When this excerpt came to the attention of the HEMA community, it was instantly compared to Irish stick, mostly for its grip. Had Hammet learned boiscin somehow or observed it? It seems that rather Hammet did like many authors before and after him and borrowed techniques directly from another source, in this case, the January 20th edition of the San francisco Chronicle of 1924. In this article the author, James I Pearson presents his method for using a walking stick which he calls an “ancient art of defense”. From “In colonial days: Selections from the Youth’s companion” 1908. 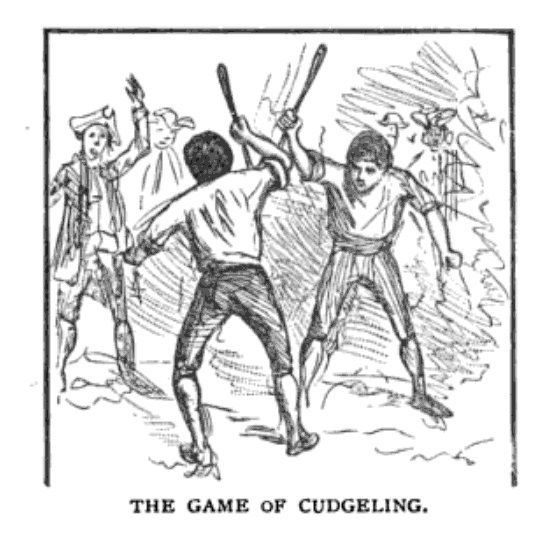 The aim of this game was to hit the adversary on the head, as in singlestick. It could also be related to the “shillalah” techniques described in Donald Walker’s “Defensive exercises”. Unless further information is found, the origin of this style remains a mystery. It is nonetheless a very interesting style which brings further details on the practice of vernacular stick fighting. The techniques present mostly attacks, and the style seems to favor a succession of quick strikes to disable an opponent rather than go for more powerful ones. The system of blocking and parrying is briefly described in a rather confusing way. Attacks blows are received on the lower part while “parries, slips and covers” are done with either ends; perhaps indicating that the lower end is used mostly for static blocking but that both ends can be used to parry and riposte. But our outlawing of the walking stick dates back to the time when this great country was discovered at the wrong end and entered by the back door, with Plymouth Rock as its doorstep. It is said of the sturdy old Pilgrim that the first thing they did on landing was to fall on their knees, and the next thing they did was to fall on the aborigines. Whether the time was long or short between these two actions, it is certain that proper attention to the activities of the local redmen required the discarding of the “old country” habit of the walking cane for the more useful musket and axe. And thereafter, through all the long pioneer days, the settler’s rifle and broad-axe prepared the way for the spade and the plow. Until that great American civilizer, the spade, had spaded the New England states into culture and prosperity. Spaded the transcontinental railway tracks that opened the land for the white man’s work and holding. Spaded the Panama cut that links two mighty oceans and opened to the world a new sea path of short route between known markets and new areas of colossal supply. There was no room for walking canes in this land of the setting sun when our great country was in the making. But in the older lands of our forebears there were very different conditions. Good roads; rubble filled and tamped into hardness by age-long traffic. Well settled country with an average distance of eight miles between village and nearest market town. Pedestrianism flourishing and everyone walking. Even “carriage folk took the air” and exercise of walking. And all who walked carried a stick or cane. The peasant carried a stick and was frequently an artist in its use against any opponent, from footpad to a vicious dog. The gentleman carried a cane, in addition to his side-arm of the small sword. But it was not the mere possession of the cane that signed his gentlehood. It was his practiced manner of carrying it. His unobtrusive but expert use of it. 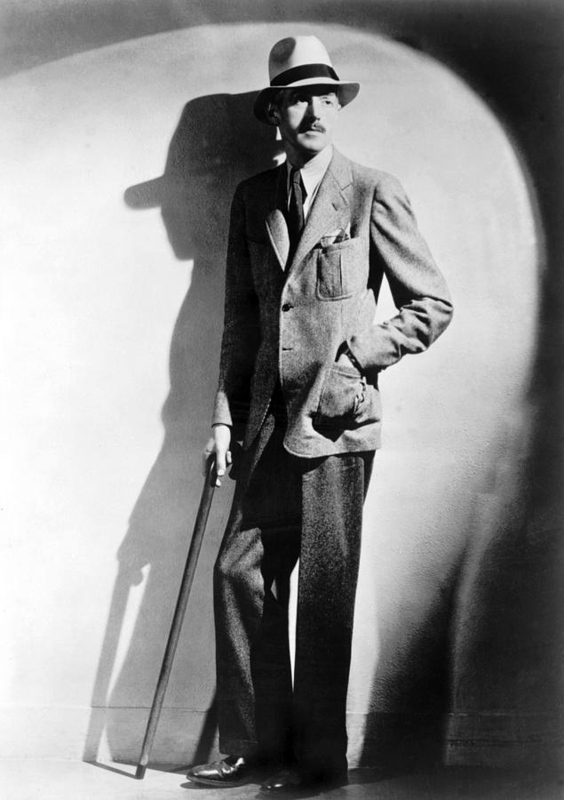 In final summary “his nice conduct of a clouded cane.” Which was equally nice and proficient when he handled a stick. To swing, slash, cut and thrust with a stick is the natural impulse of every healthy male, and as all of us cannot have a public park, or a ten-acre lot for the exercise we work off our tendency and surplus vigor in games where slugging has to be done. Witness our baseball bat: the English cricket bat; the Scot golf club, and all the milder smashing and driving devices – from tennis racket to croquet mallet. This testimony is world wide. The Canadian “lacrosse” the dextrous polo stroke and the forceful smiting in the forgotten games of badminton, battledore and the utterly obsolete Scots’ game of “stick and stob”. All are evidence of the ebullient energy that finds its proper outlet in the thrust and swing of the human arm. The fashion is not yet found that can finally curb and control the deep rooted instinct (of) a healthy human. And while the circumstance of pioneer days and the fallowing of a fair land made for the suppression of the walking stick during the working day – and made every day a working day, it can be noted that the suppression was made by the substitution of hand implement, or weapon; and that the widespread necessity for this substitute has now passed. The pioneer days are done. The fallowing is fulfilled and our world-place is now front rank among the nations. From the travail of our earlier times we have earned this rank, and up to the limit of our far flung hordersm from Atlantic margin to the Pacific Coast line, we have earned the right to follow whatever decent fashion that most attracts us. And when our “Little old New York” preaches the pleasing human revival of the walking stick and the clouded cane, we say, “Oh, Boy, and we are with you.” And in return we of the West will tell you something about stick control and its particular use in tight places. We also hope that this teachment may help some of your young men to lose their ever present (i.e. never absent) self-consciousness of the size and enormity of their hands. And now for the art of the walking stick as a weapon. We have all read Robin Hood and his “Merrie Men.” Of Friar Tuck and Little John, and of their quarter-staff play. But few of us know that the quarter-staff was the universal and very effective weapon of the foot soldier and the English peasant in their far off time. And still fewer of us know that the walking stick carries the quarterstaff science of attack and defence that has come by evolutionary process, in direct descent from the quarter-staff, through back-sword, single-stick and cudgel play. The elimination that results from age-long use and practice has simplified the walking stick guards and cuts into a few simple movements; but simple as they are, if rightly used, they will stop and defeat any attack made with sword, rapier, club, or the onslaught of a mad dog. There are five points and one guard in the arms manual of the stick. And three points and one guard against dog attack. They are, respectively- guard, chin-blow, throat stab, temple-blow, eye-stroke, crown-blow, also, block-thrust and side strokes. Any walking stick or umbrella can be used; but the preffered stick is about one-inch diameter and parallel from end to endé That is to say, the stick should be straight, and without knob, crook or bend. The overall length should be about thirty-four inches. But that varies according to the arm length of the user and should be ascertained as follows: Grasp the stick in the right hand, so that its ferrule and (b) just reaches and covers the elbow, when the arm is bent. Illustrated in the central figure with (c) as the grasping point, the length from (c) to the elbow should be just the same as from (c) to (a). That is to say, (c) is the stick’s center and the length from (c) to (b) having been ascertained, the length from (c) to (a) is made equal to the length of (c) to (b). Here is my interpretation of the sequence. Note that the chin-blow is missing. ← A thorny issue: what did the sticks look like?